If you are one of those who think that moisturizer and face wash is for women, well mister! I got news for you! No woman likes dry skin or acne on her man! A good face wash: Soap is too harsh for facial skin and will strip it off natural oils. Use an oil free, mild face wash. Use a teeny tiny bit and wash your face twice a day, morning and night. Splurge: Amongst the high end brands, Kiehls and The Body Shop make good face washes. Save: Garnier, Pears, Lakme, Nivea. PS: Honestly, I would say avoid face wash if you can go natural. But not many of you would appreciate washing your face with besan, so, stick to face wash. 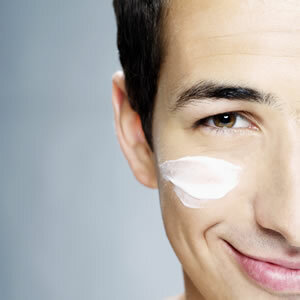 Choose an oil-free sunscreen with SPF 20, or higher if you plan to be in the sun for longer. Apply it 15 mins before you go out of the house on all exposed skin. And yes, even on cloudy days. Neutrogena and Kaya sunscreens are my favourite. You could also try Garnier for men or Lakme (a bit oily in my opinion). Moisturizer! : A heavy duty one if you have dry skin. And a light, oil-free one for oily skinned lads. My recommendations: Dry skin: Dermalogica dry skin range or Nivea. For oily skin, Clean & Clear works best. In case you have dry skin all over, go for a body lotion too. And a body butter during winter. The Body Shop makes delicious ones, but your regular Vaseline does the trick pretty well too. Lip balm: Don’t you dare forget those lips! Nobody likes chapped lips. They ruin the look of your face, your smile, your kiss. Now you wouldn’t want that! Reco: Burt’s Bees, Kiehls No Shine Lip Balm. Treatment products: In case you have acne, you need something extra to treat those annoying zits. Benzoyl Peroxide .025% used at night works very well. If you have severe acne, consult a doctor. Got dark circles? Well, honesty, they can be genetic so you cannot remove them, but you can reduce them. Under eye creams and even cucumber slices and tea bags help reduce their appearance. There you go! 5 essentials for healthier looking skin! Not that difficult to do now, is it? Colourblocking: how to and how N-O-T to! Lucky that my guy actually takes very good care of his skin! Loved the post and this must be shared around!! Men need to know that having bad skin and chapped lips is not manly.